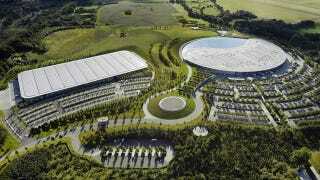 McLaren, officially known as the McLaren Group, is now officially known as the McLaren Technology Group. What's in a name? Plenty. And it comes with a new 600,000 square-foot facility to prove it. McLaren hasn't been just a Formula 1 team and a sports car maker for a while. Its data-obsessed offshoot, McLaren Applied Technologies, has been using the lessons gleaned from racing – specifically live data beamed directly into the Woking mothership – to optimize everything from drug trials and bicycles to the aviation nightmare that is the Heathrow airport. Of the 3,000 employees at McLaren, only one-third are working on the motorsport side, and if you want to get a taste of the scope of its data analytics read this awesome piece over at Bloomberg (it's worth the time and horrid graphics). With the new name comes a new 613,000 square-foot "applied technology center" that will be built alongside Ron Dennis' architectural homage to clinical precision, with "additional aerodynamic research facilities, workshops, research and development space, offices, meeting rooms, teaching and training space, and vehicle preparation and assembly areas." That doubles McLaren's existing facilities and it's a massive step in expanding the company's capabilities – as well as continuing to help fund the stuff we love.